While potatoes are inexpensive to buy, there’s nothing quite as delicious as homegrown potatoes. I LOVE unearthing some and cooking them right away. My favorite new potatoes are fried, or steamed together with fresh peas: YUM! If you’d like to learn how to grow your own potatoes, you’re in the right place. To grow a successful crop of potatoes, you need to have good, rich soil, as this is a hungry crop. With the right food, plenty of water, and a feed during the growing season, you should get a healthy crop of potatoes. 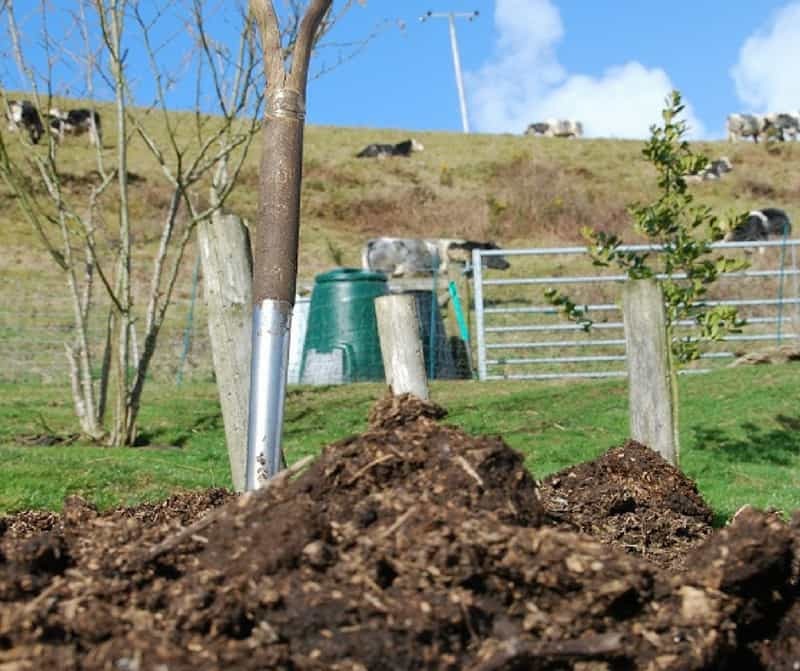 Here’s how to prepare the soil for growing potatoes: in the fall, work on the land by digging or rototilling and incorporating plenty of well-rotted manure. This will also help preparing the soil for other root vegetables as well. You should add the well-rotted manure either in the fall preceding the next year’s crop, or in the spring just before planting. The advantage of adding manure in the fall is that worms will have a chance to draw the manure lower into the soil. Then, double dig the manure in, and your soil will be in perfect condition for potatoes. Even with this heavy feeding you should also add garden compost or leaf mold in the spring, so that the soil will retain more water and help with the development of your potatoes. You can plant your potatoes in trenches, and as an additional fertilizer dress the trench with a Fish, Blood and Bone food and line the trench with seaweed. The reason to use seaweed is that it is high in nutrients and the salt content helps to deter slugs. Of course seaweed is not practical for everyone, so as an alternative, if your comfrey has started to grow, layer the trench with the first cut, you could also use nettles or a pelleted fertilizer. Potatoes need a lot of nutrition, and the more you feed and work the soil, the more the crop will reward you. In fact, the potato patch should be the most heavily fed part of the garden. In general you can add one wheelbarrow of manure per square yard of potato bed. Start by choosing your variety of potato. Supermarket potatoes are NOT the right potatoes, no matter how much you might like them. You can choose from hundreds of varieties, as well as names such as first early, second early and maincrop. So let’s begin by clearing up what these phrases mean. The first early potatoes are smaller potatoes and will usually be the first be harvested. The Jersey Royal Potato is the classic first early. However, you cannot grow Jersey Royals unless you are on Jersey, so if this is a variety you enjoy choose the International Kidney variety. Although the term first early tends to lead you to believe that this is an early potato, this is not strictly the case. It would be more accurate to state that the first early potato is the quickest to grow, usually taking ten weeks from sowing to harvest. The second early potatoes are the next crop to be harvested, assuming you planted your potatoes at the same time. They take another three weeks to mature, normally being ready at 13 weeks. The second earlies are still small potatoes, although they are usually a little bigger than the first croppers and make perfect salad potatoes. The main crop potatoes are, as the name would suggest, the largest and most versatile main crop of potatoes. 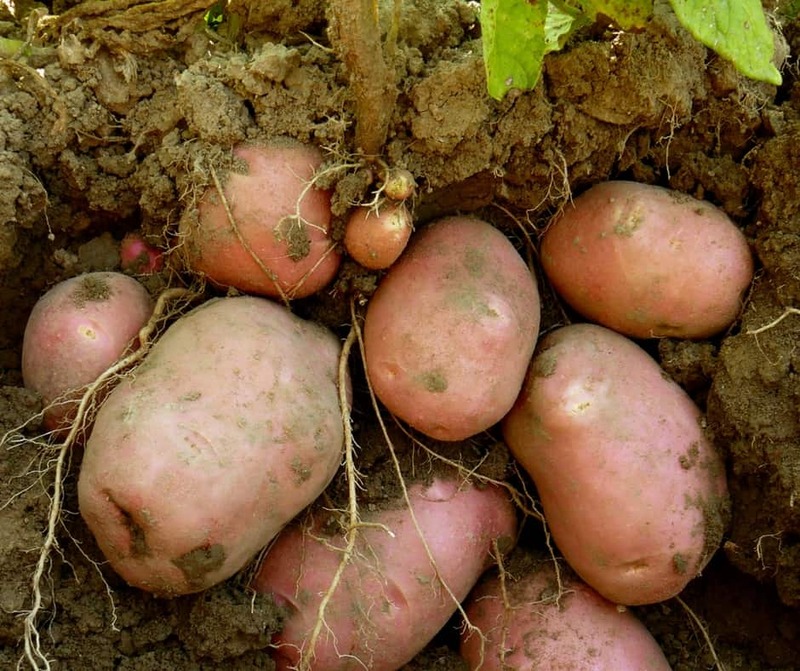 The maincrop will usually provide the larger storing potatoes and make perfect baking, mashing, roasting and french fry potatoes, taking 20 weeks to mature. Some usual maincrops would be Maris Piper and King Edwards, although a favorite that break the rule is the Pink Fur Apple potato, a very old salad variety. And for something a bit different why not try the Salad Blue, which is neither a blue or salad potato, more accurately described as a traditional floury main crop potato, tinged with purple. When you are choosing your potato varieties, do so early in the year as by at least mid-February you will need to have your potatoes chitting. Chitting is not complicated, but it is important so that you give you’re a good start before sowing. Quite simply, chitting is just laying out your seed potatoes in a tray with the side with the most eyes facing up, and leaving them in a cool, light, frost free room so that they start to shoot. Chitting is really giving your potatoes a head start so that they establish and crop earlier. Have you ever had potatoes in your garage starting to sprout? Of course you did: I did too! You moight be tempted to think you can use these to grow some potatoes, but it’s not advisable. Potatoes are grown in specific conditions, to prevent viruses. Certified seed potatoes are tested to make sure they don’t have any viruses to pass on, which will make sure that your garden doesn’t become a breeding ground. This is why it’s advised not to use regular store bought potatoes as seed – they aren’t certified free of viruses. Don’t try and cheap out – buy certified see potatoes from a safe source. Lay your seed potatoes in potato chitting trays (you can also use egg boxes) and put them in a lean-to shed or other frost free place, which has plenty of light. When it is time to sow the seeds you will place them in a trench with the shoots facing upwards – if you would like larger potatoes in your main crop varieties you could break of all but one or two shoots before planting. 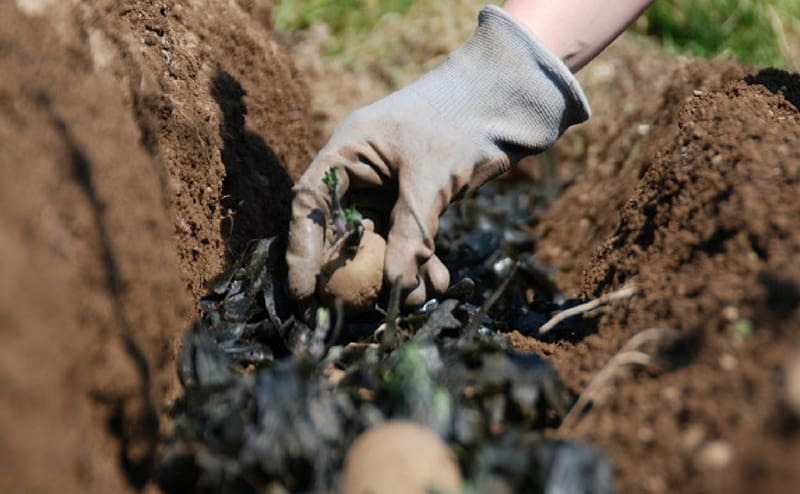 Traditionally potatoes are sown at Easter, which has more to do with the workers holiday rather than being a rule of thumb, but Easter does make a good reminder to get ready for planting your spuds. 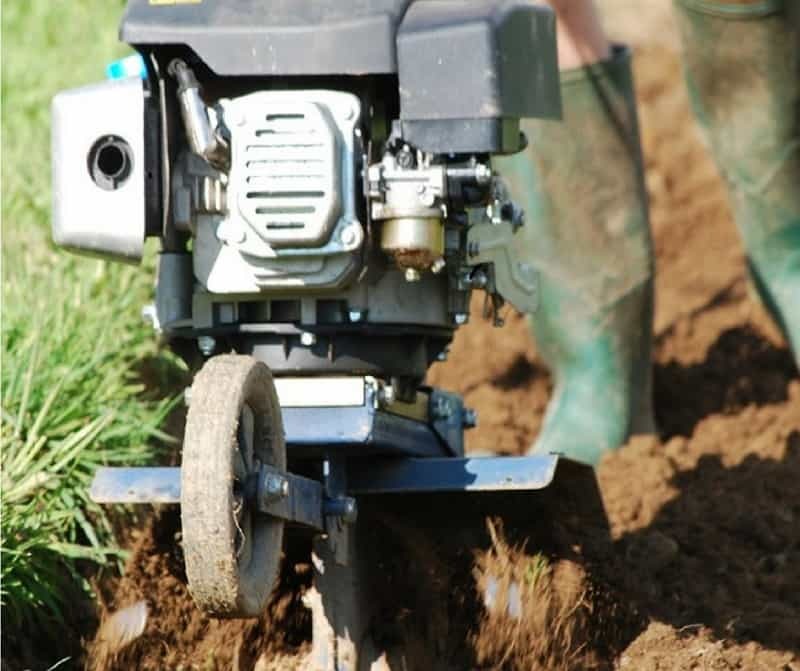 As Easter is a movable feast falling between the 22nd March and 25th April, it is probably safe to say that potatoes can be planted from the last week of March onwards, and can be sown right through the spring and early summer. The rule on how late they can be planted depends on the first frost of the autumn, and which type of potato you are growing. Maincrop can go in as late as the end of May and first earlies by the end of July, and both plantings should give you a crop of potatoes for mid-October. So on to planting your potatoes; plant potato seeds in a trench at the depth of about 3 inches for small potatoes and 5 inches for larger maincrop. Sprinkle some blood and bone fertilizer at the bottom and sides of the trench, layer with seaweed or comfrey, and plant the seeds with the chitted shoots facing up. Space first and second earlies 10 inches apart with 15 inches between rows, and maincrop use a 15 inch space and 30 inches between rows. 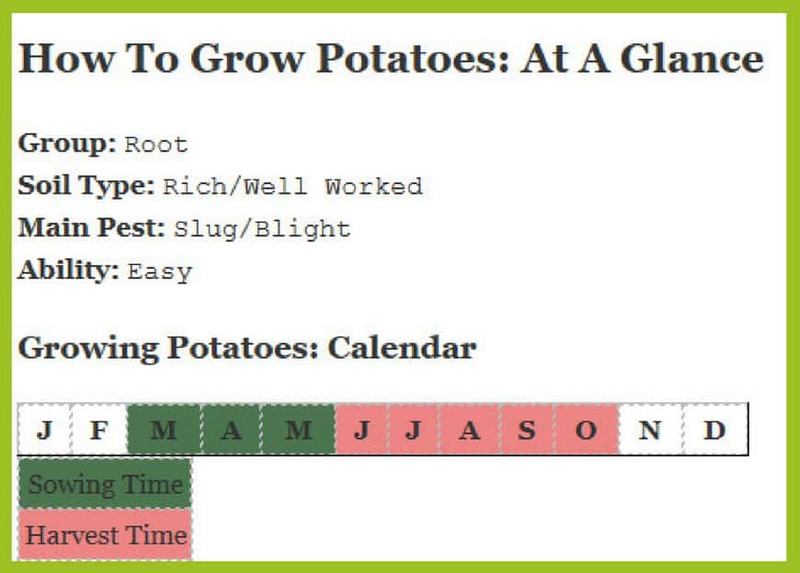 Learn more about spacing your potatoes here. If seaweed or comfrey are not available use a manure, garden compost, pelleted fertilizer or a municipal compost. Then cover the trench, drawing the soil up to a peak. For the first month, when the risk of frost is more threatening, as the green plant shoots start to break the soil, draw up more soil to cover and protect them. The soil covering will also protect the tubers from light, which turns them green. Continue to cover if you see any potatoes forming at the surface. The first and second earlies will not need an extra feed, just a watering if dry, and a watchful eye on weeds. Maincrops however will definitely reward you for some extra nutrients which could come in the way of a liquid comfrey tea, a mulch of comfrey or nettles, or a commercial liquid fertilizer. Potatoes are susceptible to several sorts of pest and disease, some that are more common than others. Other than the onslaught of slugs, if this is your first time at planting potatoes most of the issues are only recognizable at the time of harvest when, unfortunately, the damage is already done. Not that this should dishearten you, as most of the diseases you could possibly encounter can be overcome by selecting varieties that have a bred resistance to the problem your garden soil is harboring. Here is a potato pest and disease list to help you identify and cure any problems you encounter. 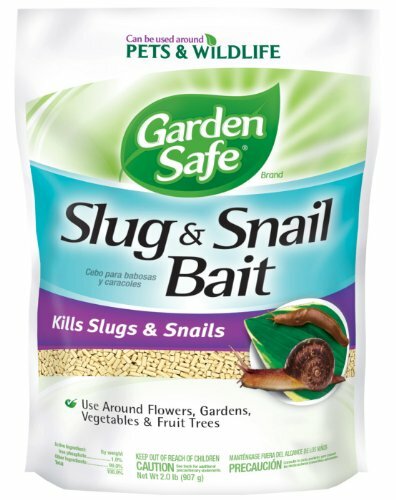 Garden Safe Slug & Snail Bait (HG-4536) (2 lb) Slugs probably cause the most damage to potatoes, so whatever you do to control slugs, triple your efforts around potatoes. 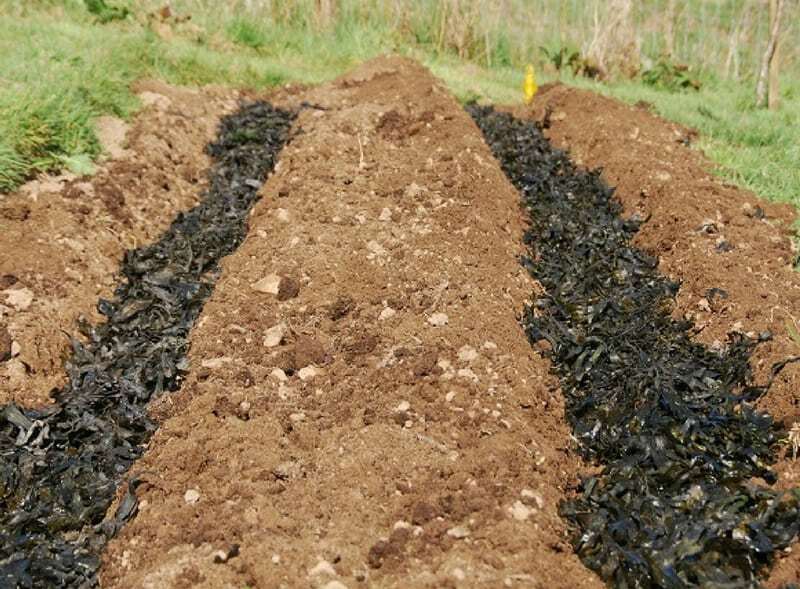 One of the advantages of lining the planting trench with seaweed is that the salt helps to keep the slugs off, although the effect will not last for the whole growing season of the main crops. We don’t like to use slug pellets unless we can keep wildlife off, so it tends to be beer traps or dawn and dusk slug hunts. Nematodes are another possibility, these are slug parasites that you water in, and they do fit into an organic system. 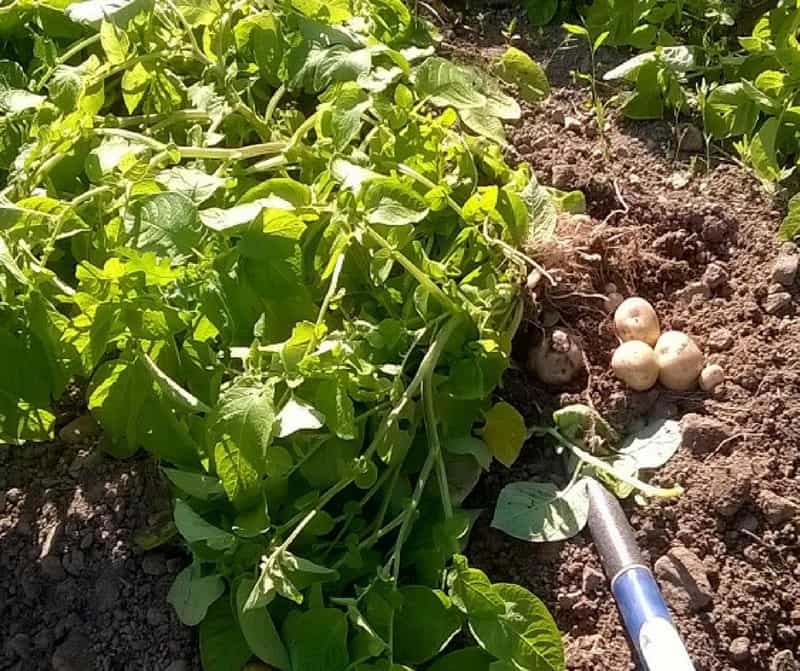 Barriers such as sand, coffee grinds and eggshell can help to keep slugs from entering the potato patch, but will do little to protect your potatoes from the slugs already present. Take a look at the pest and problem page for more ideas. Blight is an air borne fungal disease that causes the leaves of the potatoes to wither to a wet rot, turn brown and die. It is more likely that you’ll see an infection of blight if the weather is wet and humid. Fortunately, only the main-crop varieties that are vulnerable. If you get an attack of blight you will at first see the evidence on leaves, once about a quarter of the leaves carry the infection, or if you notice browning of the stems, you will need to cut off the haulm, or foliage, of the plant and dispose of it. Then two weeks later, harvest the potatoes. To avoid blight, always keep to the spacing recommended by the potato seed producer. There should be plenty of airflow between the leaves so that they can dry more quickly. Rotate your crops and use certified seed producers to guarantee that you are not introducing blight spores to your area. If blight is a problem there are blight resistant varieties available, such as Sarpo Axona, Sarpo Mira, Cara, Kondor, Pentland Dell and Pentland Squire. A brown rising of the potato skin, which looks unsightly, but has no real detrimental effect on the potato itself, as long as it is peeled. Scab is caused by an irregularity of water early in the growing season and can be avoided by mixing plenty of compost or leaf mold into the soil to help it retain water. Of course water as needed in dry spells. 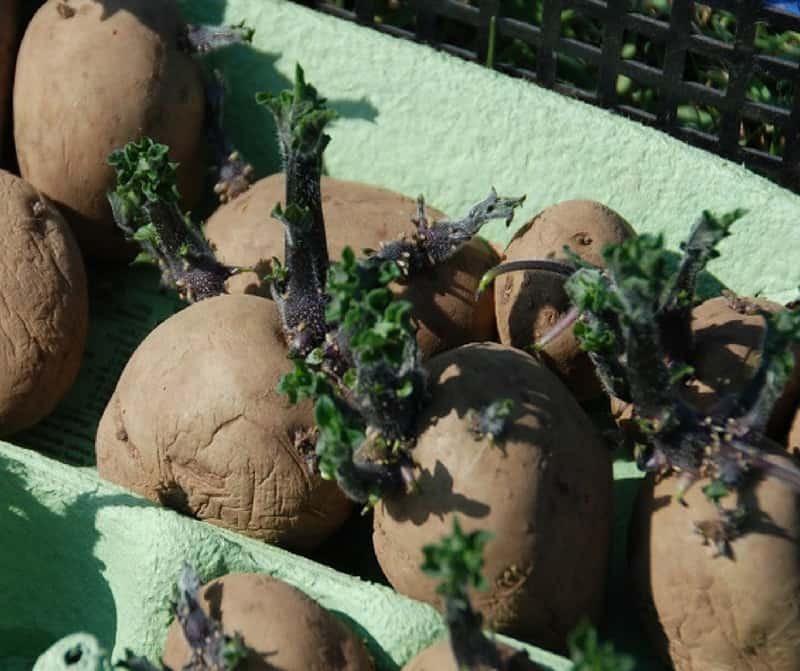 If you have a problem with potato scab you can grow scab resistant varieties such as King Edward, Nicola, Accent, Casablanca, Maris Bard, Nadine and Arran Pilot. Potatoes are susceptible to many other problems. This is why growing potatoes comes with a range of rules that many gardeners will tell you to follow. Although these are all quite rare, that’s quite a collection of problems. The time to harvest potatoes depend on your situation. For example, I harvest potatoes throughout the summer, because I LOVE new potatoes, and enjoy cooking freshly harvested potatoes. But if you want to harvest for winter, let the potatoes in the ground until just before the first frost, and the leaves have dried up. This gives the spuds a chance to get all the nutrients they can, while keeping them safe in the ground. Harvesting your potatoes couldn’t be easier. When the time has come to bring your potatoes in, lay a burlap sack, fleece or an old blanket on the ground and use a gardening fork to uncover your potatoes. Drive the fork down at the base of the drawn up soil, gently leaver it under the potato mound and lift. Turning the soil this way will reveal a mass of round nuggets. There is nothing that is quite as satisfying as enjoying the results of hard work! Once you have turned the spuds, pick them out and place them on the blanket to allow them to dry and their skins to harden. After about an hour sort through the potatoes putting perfect samples into a dark paper or burlap sack. Keep the damaged ones to be used right away. It may also be worth tossing in a scattering of slug pellets, just in case the odd slug made it past your scrutiny. And after a few weeks, recheck the bags just in case any potatoes are getting soft. 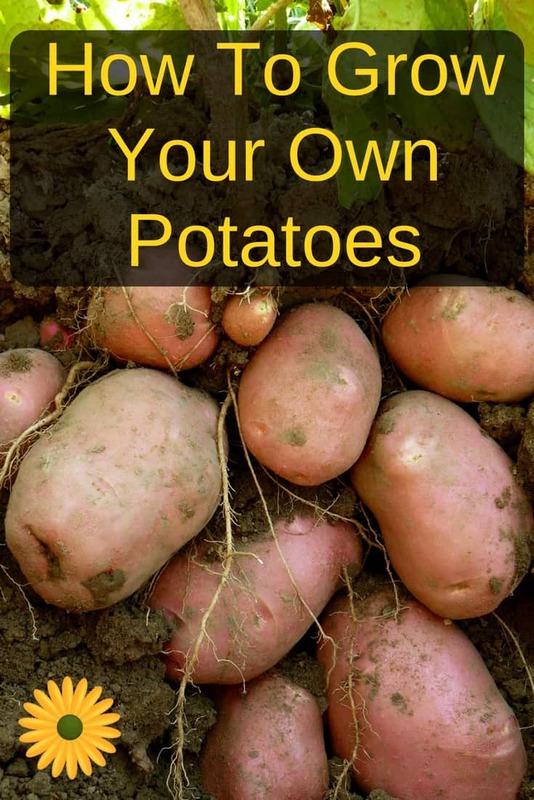 So now you know how to grow your own potatoes. Enjoy the experience! Learn more about planning your vegetable garden. A list of recipes for potatoes could quickly turn into a book, such is the versatility of the humble potato. But you may want a few ideas to use a glut of potatoes, especially if you have had a lot of damage from your harvest. In Ontario Canada farmers are being asked not to apply manure in the fall because it is altering spring runoff waters and thus creating a great deal of algae in lakes and rivers.